Book Launch at Octavia Books, 513 Octavia Street, New Orleans. Tuesday, April 16, 6 pm. The Tommy Sancton Trio will perform. "Love for the city of New Orleans and its music flows through this book like a beautiful melody. Those who share these passions will want to have this memoir from legendary trumpeter Clive Wilson on their bookshelf." THOMAS BROTHERS, author of Louis Armstrong's New Orleans. 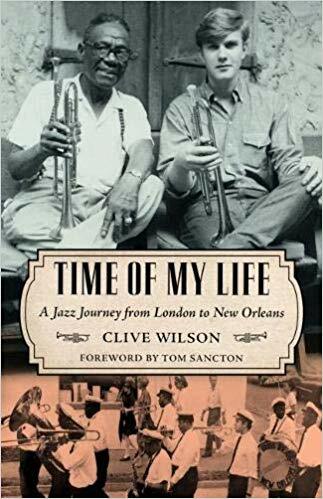 "Clive Wilson's Time Of My Life tells the seemingly unlikely tale of an Englishman who crosses the color line and becomes accepted as a first-call traditional jazz trumpeter in New Orleans. It's an informative and entertaining memoir, full of new insight into the city's jazz scene from the mid-1960s on." BRUCE BOYD RAEBURN, curator emeritus, Hogan Jazz Archive, Tulane University, and author of New Orleans Style and the Writing of American Jazz History.